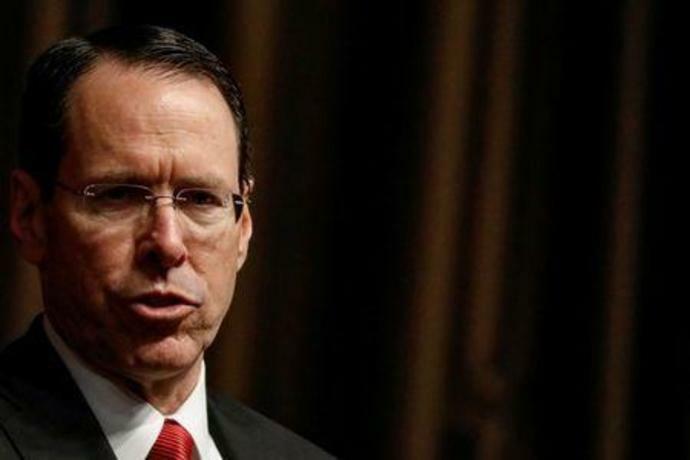 WASHINGTON (Reuters) - AT&T Inc Chief Executive Randall Stephenson said Wednesday that China's Huawei Technologies Co Ltd is making it very difficult for European carriers to drop the company from its supply chain for next-generation 5G wireless service. "If you have deployed Huawei as your 4G network, Huawei is not allowing interoperability to 5G -- meaning if you are 4G, you are stuck with Huawei for 5G," said Stephenson at a speech in Washington. "When the Europeans say we got a problem -- that's their problem. They really don't have an option to go to somebody else." The United States has been pressuring other countries to drop Huawei from their networks. Stephenson said the U.S. government could do a better job explaining the security risks of Huawei. "The biggest risk is not that the Chinese government might listen in on our conversations or mine our data if we use their equipment," Stephenson said. Within a decade, 5G will drive all U.S. factories, utilities, refineries, traffic management and help underpin autonomous vehicles. "If that much of infrastructure will be attached to this kind of technology do we want to be cautious about who is the underlying company behind that technology. We damn well better be," Stephenson said. Huawei did not respond to a request for comment Wednesday. The United States warns that next-generation 5G equipment, which some telecoms experts see as more vulnerable to attack than previous technology, could be exploited by the Chinese government for spying if supplied by Huawei. Huawei has grown rapidly to become the world's biggest maker of telecoms equipment and is embedded in the mobile networks and 5G plans of many European operators. It denies that its technology represents a security risk. In the United States, 5G networks will largely be built by Nordic equipment makers Ericsson and Nokia , and Strayer said there were safer alternatives to Huawei. The United States has also alleged Huawei violated its sanctions on Iran and stole intellectual property. No evidence of spying has been presented publicly even as scrutiny on Huawei has intensified, and several Western countries have restricted the firm's access to their markets. Chancellor Angela Merkel said on Tuesday Germany was not planning to exclude any one company from its 5G auction per se, but rather wanted bidders in the mobile spectrum auction to meet certain requirements. LONDON (AP) - Reports that Chinese telecoms company Huawei will be allowed to provide parts of Britain's future superfast internet networks have drawn criticism, with one lawmaker saying the decision increases the risk of Chinese cyberespionage.